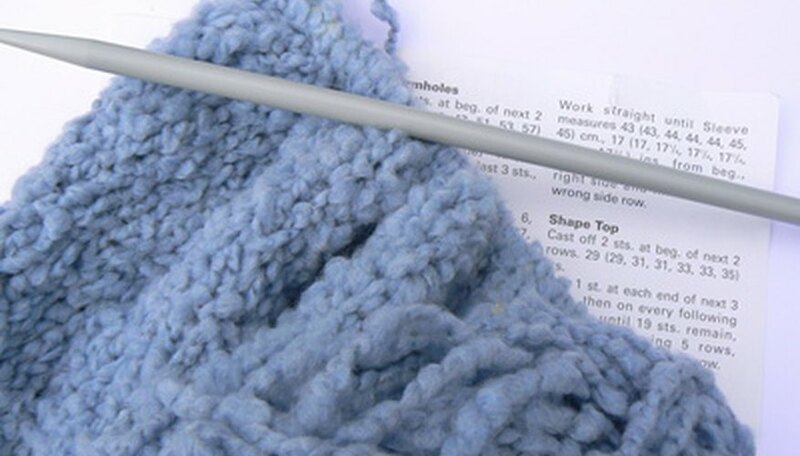 To end a knitting project, you'll need to "cast off," which is a fairly simple process. Casting off allows the knitter to move her work neatly off the needles, leaving a finished edge that won't unravel. Learn how to cast off properly and you'll be on your way to tackling new knitting projects with confidence. Slip the first stitch onto the right (empty) needle, then knit the second stitch. Note that you have two stitches on that needle. Lift the first slipped stitch, then pull it off over the second stitch and off the needle. Knit the next stitch. Note that you have two stitches again. Lift the first stitch over the second stitch and pull it off the needle. Continue this action until you only have one stitch left. Cut the remaining yarn, leaving a 6-inch tail. Slide the last stitch off the needle, then pull the yarn through the last stitch. Once you actually start casting off, the process will make a lot more sense to you. It's easier to do it in practice than to read about it. Some patterns refer to the process as "binding off." Work the tail of your yarn back into your work with a needle, rather than cutting it off close to the end knot. This prevents unraveling and unsightly knot-ends. A 2004 graduate of United World College of the American West in New Mexico and a 2008 graduate of Vassar College in New York, Philosophy Walker is a freelance writer and poet. She has published pieces in the "Los Angeles Times," the "Poughkeepsie Journal," and "Barron's Guide to the Most Competitive Colleges."